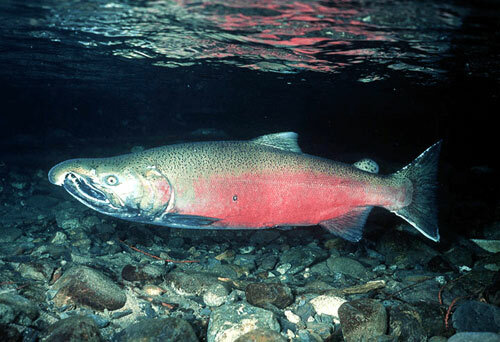 BC’s salmon is known as a keystone species; one that is essential to the functioning of the ecosystem as a whole; the foundation that supports an entire network of life. British Columbia’s salmon have defined a culture and provided a natural food resource since time eternal. The Fraser River, known as the biggest salmon spawning grounds in the world shows the numbers of migrating Chinook declining and a dangerously high pre-spawn mortality rate on identified migration routes. Since the late 1990’s this curious phenomenon had been blamed on other factors from water temperature to commercial over-fishing, but Alex Morton took a new approach and followed the juvenile salmon into the wild to study them closer. What she found was shocking and immediately apparent when these little smolt merely swam past an industrial fish farm. Like swimming through a leaking toxic waste dump, they were instantly exposed to a new deadly threat; parasitic lice laden with bacteria and viruses. The reason for this toxic environment is farm fish are unnaturally contained and heavily compacted into small corrals awash in their own waste that breeds the bacterium and leaks into the surrounding channels like an oil spill. After much testing and research with the help of a concerned geneticist, the disease was identified as the ISA (Infectious Salmon Anemia) Virus; a leukemia virus that attacks the immune system, which had mutated and spread through eggs imported from Norway. The symptoms are beyond repugnant: skin lesions and blisters, yellow mucous covered gills, bleeding through the flesh that causes death from the inside. 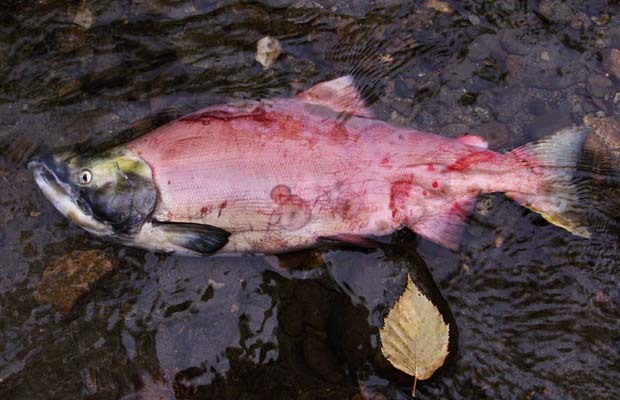 This is what’s been happening to more than half the salmon in some of our local rivers. Since the first findings and subsequent inquiry the DFO in Nanaimo has closed its laboratories to the testing and research of this atrocity. The federal government gagged the geneticist, closed her research and muzzled every other scientist who echoed her revelation in the mysterious decline of our precious Chinook. Even the other testing facilities who found the virus were threatened and the ramifications by federal government included attacks in the form of audits, muzzling and credibility assassinations. The media spin by federal government officials was to lie to the public and say there was no virus found in BC’s wild salmon. In truth, their internal email communications contained explicit cheers of victory for helping maintain the lie that there was no problem. Unfortunately for them they were sabotaged by their own body language; in every interview and inquiry their lips remained tightly pursed and their responses were indignant and curt. Finally, in their most stoic manner, they admitted the reason for withholding the outbreak is it would interfere with international free trade, even though it is mandatory to report these types of diseases. 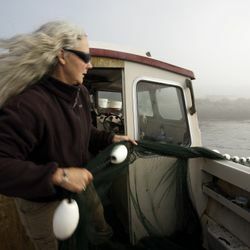 Additionally, they prohibited anyone from testing farm salmon and allowed fish farms to keep their records confidential. Then, in a blatantly vile move, the Bill 37 Animal Health Act was introduced and if passed it will make it illegal to report dangerous diseases in farm animals to the public. A subsequent cause for concern is these diseased farm fish are being sold in grocery stores locally and all over the world. Yes, ISA is in our supermarket farm fish right now: it is the same fish we take home, wash the diseased mucous off and then lovingly prepare and present it to our family. Health officials warn us that disease from farm animals is one of the biggest sources of epidemics in humans. In comparison, eating the ISA virus in farm salmon is likened to eating beef with mad cow disease. Additionally, in some areas the diseased mucous that goes down the drain is sent back into our water supply and is not filtered out of our drinking water. ISA, aka salmon flu is just one of three Norwegian viruses. The other two are Salmon Alphavirus, which causes pancreas disease where entire farms must be destroyed; and, since 2010, the Piscine Reovirus, which turns the heart muscle to mush, where the salmon are unable to hunt, avoid predators or swim up a river rapid like Hells Gate on the Fraser River during migration. The wild salmon crisis is a province-wide problem and the government is not only doing nothing to address it; it is consistently covering it up merely to protect mindless investors who will simply move on to another investment once the salmon are gone. Currently, work is being done on a cooperative level to train local fishers and volunteers to identify diseased fish and have them tested. Today, they must be sent to Norway to be tested, which is a costly endeavour, simply because of Nanaimo’s DFO resistance. Ideally, we would have a local lab to test these fish immediately and resolve this abhorrent issue more quickly. Again, it comes back to the people of Canada to take care of yet another of our most precious resources, our salmon. More so, we need to take care of them, because they take care of us.